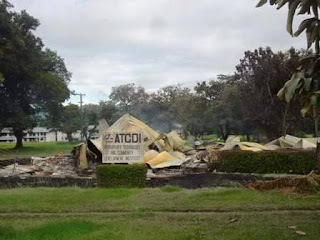 A fourth year student has been arrested and charged for the alleged arson of four buildings at the University of Technology in Lae last June costing almost K50 million. On 25th June 2016, Graham Romanong a first year student at Unitech was allegedly willfully murdered and on the next day in the early hours of 26th June 2016 four buildings including the students mess, the SRC President resident, (White House), the ATDCI building were gutted down by fire. The alleged murder case is now before trial hearing at the Lae National Court whilst the alleged arson case had its first suspect arrested last December. Police investigations are still continuing says Assistant Commissioner Police (ACP) Northern Peter Guinness. ACP Guinness said given that the arrest was made whilst students were sitting for their end of year exams last December, precautions were taken not to cause further inconveniences and disturbances. Mr Guinness confirmed yesterday (Wednesday) that the student who hails from Enga province was arrested last month (December) and is currently out on K2000 police bail. Mr Guinness confirmed that the student is a fourth year mechanical student attending Unitech and police investigation is ongoing and in the course if more evidence and suspects are identified then the law will take its course with further arrest and charges. “This is an ongoing investigation. We will continue with this investigation until we arrest and charge everybody even half of the students at the Unitech .I will do what I have to do,” said Guinness. He added that there are so many young men and women that want to go to university so as long as they are ok they can go to school but those suspected of committing crimes must be arrested and charged and allow the process of the law to take its course.